Is Vikings quarterback Case Keenum good? 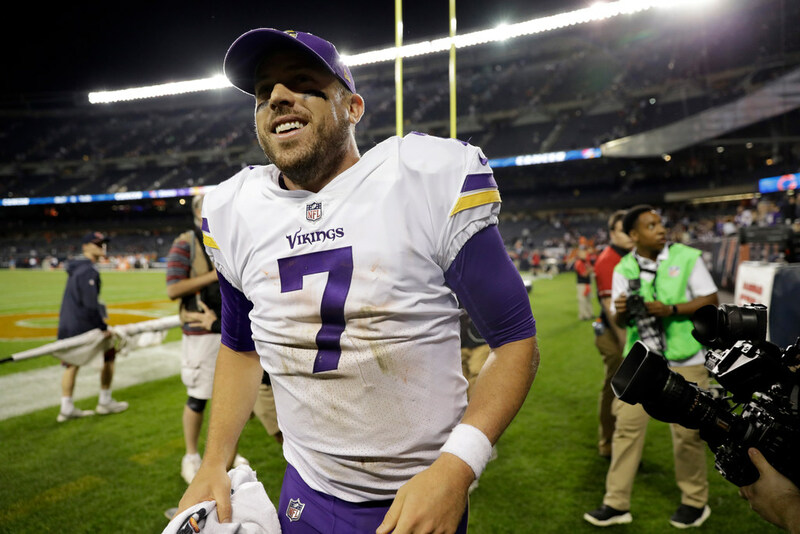 The most important Vikings quarterback is the quarterback of the moment, and that would be Case Keenum, who came to the Vikings as Sam Bradford's backup. Amidst all the worrying about Sam Bradford’s knee and Teddy Bridgewater’s knee, the curiosity about young Kyle Sloter, the discussion about who will be the Vikings’ quarterback in 2018 (One of those guys! A first-round draft pick! A free agent like Drew Brees or a trade for Alex Smith! ), there is the guy who is currently quarterbacking the 3-2 Vikings as they head into a home game against their biggest competitive and geographic rivals with first place in the NFC North at stake. Having watched Keenum start three games and bail the Vikings out of a fourth in Chicago — if not saving their season, at least keeping it on a better track to end well — I think we can answer “yes” and “yes” to those basic questions. We can also safely conclude that he’s better than a ghost-faced Bradford playing on one good leg. But is Keenum an objectively good quarterback, taking every qualifier out of play and just measuring him against all of his peers? Before you answer “no, he’s a career backup,” let’s examine his career path. Keenum finished his college career at Houston as the NCAA’s all-time leader in passing yards (19,217) and passing touchdowns (155) in addition to all sorts of other records. He entered the 2012 draft with those credentials and was described as being “accurate and prolific from the pocket in his Scouting Combine profile. But he’s barely over 6 feet tall and played in a spread offense in college. He doesn’t have prototypical NFL size or arm strength, and he didn’t play in a pro-style offense in college. Those are deficiencies that a lot of NFL teams, who like their quarterbacks built a certain way, are not willing to work around. So the most prolific passer in major college football history went undrafted. Keenum, a Texas native, was picked up by the Texans — same city where he played in college– as an undrafted free agent. He spent the entire 2012 season on the practice squad as Matt Schaub led Houston to a 12-4 record before the Texans lost in the division round of the AFC playoffs. Keenum was elevated to third-string in 2013 with the Texans. They won their first two games but lost their next four — with Schaub getting hurt in the last of those losses. Keenum leapfrogged T.J. Yates in the pecking order and was named the starter for their Week 7 game against Kansas City. In his debut, Keenum threw for 271 yards with a 110.6 passer rating. Houston lost 17-16, and the downward spiral was underway. Keenum started eight games that year, losing all of them, as the Texans finished 2-14. Keenum finished with better numbers than Schaub — better TD/INT ratio, better passer rating, better Total QBR — but Houston was just that bad. In 2014, Keenum was cut late in training camp by the Texans after they acquired QB Ryan Mallett — a quarterback with prototypical size and arm strength who was a third-round pick in 2011. And thus began his life as a journeyman/backup. Houston brought him back out of desperation in 2014 after injuries mounted, and he won his only two starts. He bounced to the Rams in 2015 and 2016 as the fallback option — to Nick Foles in 2015 and rookie Jared Goff last year. Now he’s with the Vikings. So is he a career backup because of his performance or because he was an undrafted free agent whose first real chance in the NFL came in an impossible situation, unfairly setting the course for his trajectory? Well, this much is true: Keenum has never played on a good team. In his four seasons on an active roster, his teams have gone 22-42. After that rough first year for an unexpectedly bad Texans team, went 9-7 as a starting QB in the next three seasons. His teams went 11-21 when someone else started at quarterback. That said, Keenum has been at or near the bottom of the NFL’s Total QBR standings — which aim to measure a quarterback’s positive impact on a game — for much of his career. In 2016, he was dead last out of 30 qualified quarterbacks. The 2017 Vikings, however, have to be considered the best team Keenum has played on. And so far this year, he ranks fifth among NFL quarterbacks in Total QBR — ahead of even Aaron Rodgers (8th) going into Sunday’s game against the Packers. His sample size with the Vikings is small and has come against pretty ordinary defenses, so making any wholesale proclamations is not smart yet. So let’s leave it here: Saying Keenum is “good” is not correct, but he is better than some of the quarterbacks who began the season as starters with their teams and is certainly better than a lot of backups. Beyond that, there exists the possibility that he has been undervalued because of his size and lack of draft position as well as put in bad situations during the course of his career, leading to a false impression of his ceiling. Keenum might well prove to be “good” instead of just “good enough.” I don’t think we know yet. I’m willing to keep an open mind for as long as Keenum is playing for the Vikings. Are you? Wiggins cashed in at the right time. Will the Wolves regret it?